Easy Slots brings you a slot game based on the classic novel by Alexandre Dumas, the Musketeer slot has 5 reels and 30 pay lines. The video slot created by iSoftBet features the famous 3 musketeers and takes players back to the historical era in France where they will be joined by the famous three musketeers, Porthos, Athos and Aramis. Players can spin for as little as 20p up to £100 and enjoy winning big from the jackpots, wilds and scatters available. iSoftBet is a software company based in London, UK. They supply online and mobile casino games to a wide range of leading e-gaming sites. Understanding their clients is their what they do best and they are trusted to develop and deliver the most innovative and creative games on the market. Their games use high-quality graphics, engaging and very easy to play. Some of their slots in their portfolio include Cash Camel, Forest Mania and Fruit Boxes. Get a free spins if you pay by phone slots. 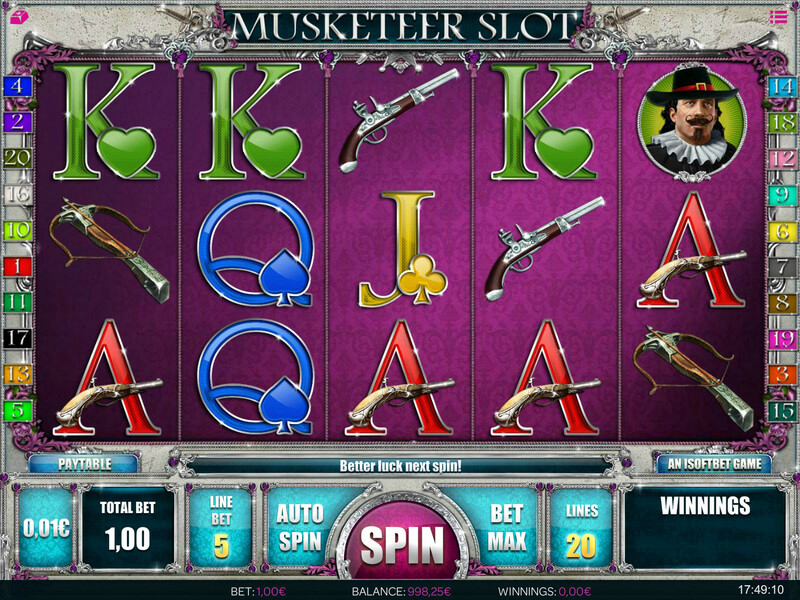 The Musketeer Slot is a 5 reel, 20 pay line video slots brought to you by iSoftBet. The game is inspired by the classic Three Musketeers novel and features some great animations, sound effects and background graphics. The royal purple background colour and castle that is behind the reels adds to the unique theme. The game is easy and straightforward to control, allowing players to change the wager for every spin with no fuss. The auto play button allows players to press auto-play for a number of spins, sit back, relax and watch the reels spin. Playing card numbers and letters (10, J, Q, K and A) are the lowest paying symbols followed by the pistol and crossbow. The playing cards pay anywhere from 100 to 400 coins for landing 3 or more symbols in a spin. Landing 5 crossbows will pay 500 and 5 pistol symbols will give you 750 coins. The three famous musketeers are the highest paying symbols offering payouts of up to 100 times your bet line when you land 5. The wild for this slot is the castle symbol which can appear anywhere on the reels and will replace all symbols other than the scatter symbol. It can also extend randomly in the normal game and during free spins feature round it can become a sticky wild. The lady with a mask is the scatter symbol and when scatter wins are formed, it will multiply your win by your total bet. 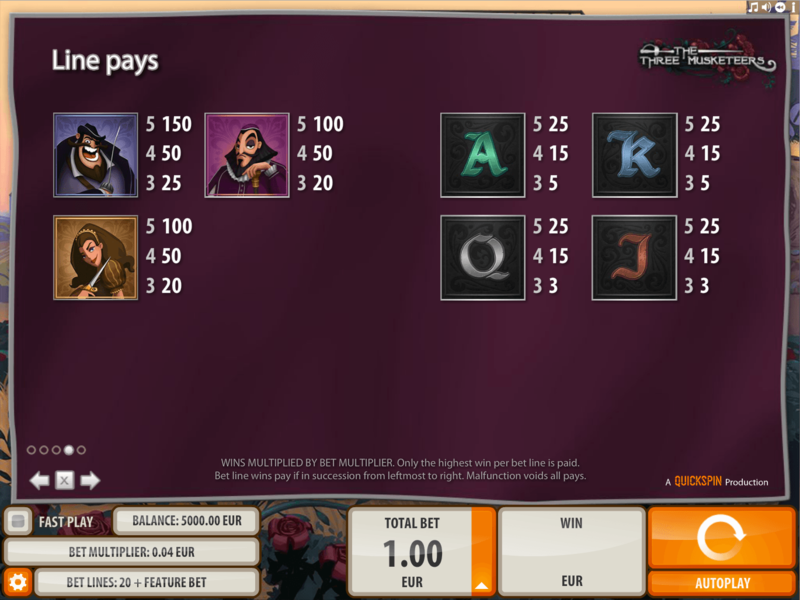 If you land 3 or more of the lady scatter symbols you will trigger the free spins round. 3 scatter symbols gives you 10 free spins, 4 gives you 15 and 5 gives you 20 free spins to use in this feature. At the end of the free spins round, a multiple can be and will be applied to the total amount of wins made, this multiplier can be between x2 and x10. There are more general Easy slots casino promos here.